Student volunteers place the fence from John Peltz’s house on a truck after knocking it down. 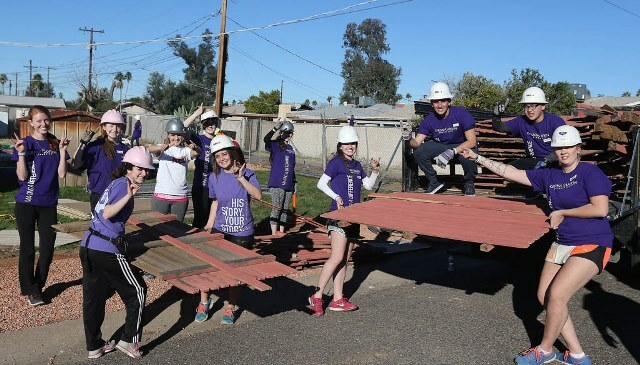 What was going on, he quickly was told, was the first day of Grand Canyon University’s partnership with Habitat for Humanity Central Arizona to renovate up to 700 homes in its west Phoenix neighborhood. 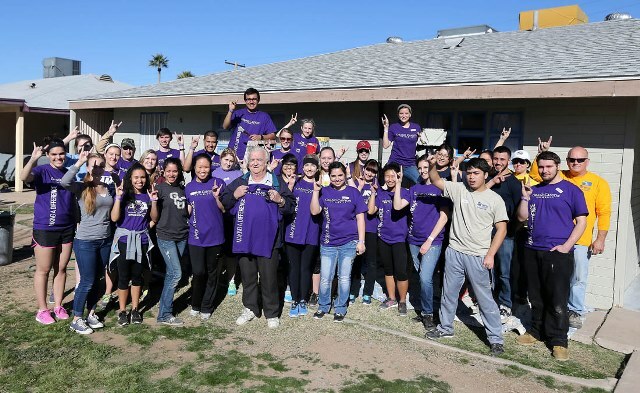 On this morning, at eight homes just south of the University on or near Mariposa Street, 200 GCU student and staff volunteers and their Habitat leaders were poised to tear down fences, put up siding, paint (lots of that) and do whatever cleanup was needed. It was exactly as Cassandra Jarles, Habitat’s faith relations manager, had predicted before the sun rose over the students as they gathered in front of the Student Union to get their assignments: The actual start of the Canyon Corridor Project would be its best advertisement, and homeowners whom Habitat’s family services team hadn’t been able to contact on any of their three visits would no doubt notice the commotion and possibly take advantage of the opportunity to have their home improved at a bargain price. Before long, Stodghill was going over his options with Habitat personnel, including its director of family services, Maribel Saucedo, and said he’s interested in having energy-efficient, double-paned windows installed and maybe some siding, too. But he didn’t stop there. Before you could say “Lopes up,” Stodghill was back outside in his purple GCU shirt — he’s a basketball season-ticket holder — and then was driving down Maricopa in his white Nissan Quest waving to the workers at each site. “He’s going to be our cheerleader for the neighborhood,” Saucedo said, laughing. Saucedo said several other homeowners did the same thing as Stodghill, which is why Habitat had its green-shirted family services representatives available, armed with pens and clipboards next to workers decked out in hardhats and work gloves. Out of the 197 homes in the first two blocks south of Camelback Road from Interstate 17 to 35th Avenue, Habitat had not been able to contact 97 of them. Saucedo’s hope is that media coverage of the start of the project plus a mail drop will get the word to the remainder and convince a large percentage of them to join the 15 homes currently in the pipeline. The goal is to add five more projects every month. 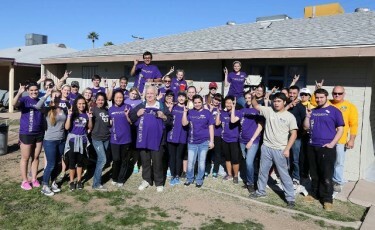 Members of one of the student teams get their Lopes up before donning their hardhats and going to work. The dominos tend to fall even more quickly when GCU asks students to help out with something. 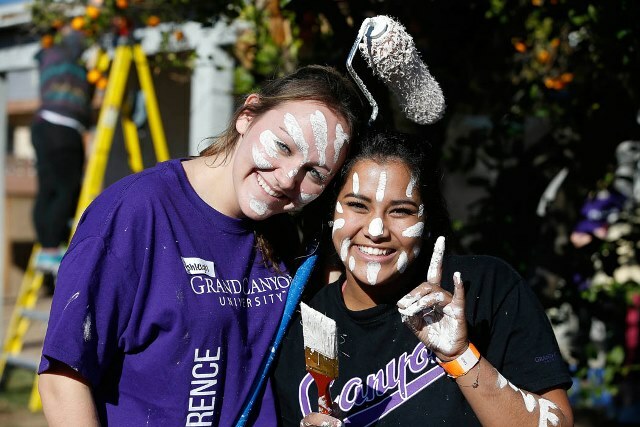 Pastor Tim Griffin, GCU’s dean of students, was amazed by the response when he announced at Chapel earlier this month that volunteers were needed for the Habitat project. Right as he said it, he noticed students throughout the audience scrambling for their cellphones to sign up. President/CEO Brian Mueller takes his painting game to new heights. Part of the reason: “Most agencies don’t know how to facilitate the kinds of numbers we can provide. A lot of times in the past, we’d get hundreds and hundreds and hundreds of students and staff, and we’d get to a work site and they wouldn’t know what to do with us. They’d have 10 paint brushes and we’d have 100 kids standing there. So we decided we’d just scale down our numbers until we found the right kind of agencies and organizations that could work with us and could employ a high number of volunteers. And Habitat has that kind of history,” he said. 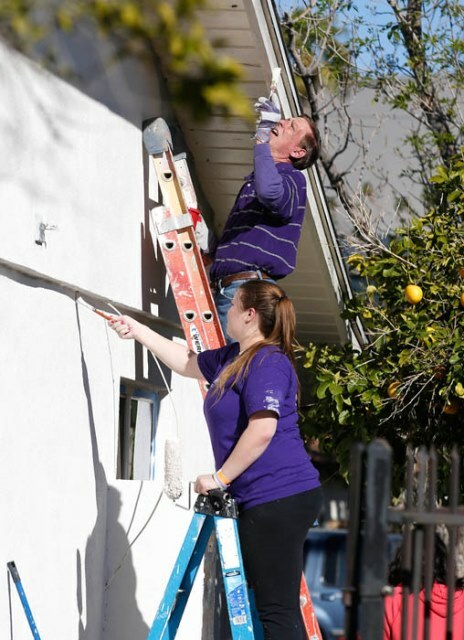 One of those volunteers Saturday was GCU President/CEO Brian Mueller, who went 15 feet up a ladder to paint an eave and just generally had a good time interacting with students. Mueller emphasized the teamwork it took to get the project started — not just between the University and Habitat, but also the many donations of time (students) and money (employees’ gifts through state tax credits). Students had a good time Saturday as well. Two of them, Sara Henschel and Ashleigh Hollaar, playfully streaked white paint over their faces after their team leader told them there would be a prize for the person who at the end of the day was covered in the least amount of paint. Ashleigh Hollaar and Sara Henschel got into the painting face first. And how long did it take them to decide the competition wasn’t for them? “About two seconds,” Henschel said. John Peltz, a homeowner on Mariposa, couldn’t believe how quickly the students were able to tear down his fence, move his shed, put up temporary fencing that will be replaced by a block wall, and start putting up siding on his house. “Unbelievable,” he said. Still to come were his new windows, which will be handled by a contractor because it’s a more complicated task. Peltz also did the first TV spot of his life with a local news crew. And how did it go? “I guess I’ll find out tonight,” he said, sheepishly. 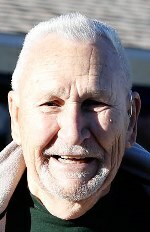 Dave Bunzel, Habitat’s community support manager, said all nine projects (one house has two) flowed smoothly Saturday. Some students shifted to another site when they finished early, but there was plenty of help at each house and everyone seemed to have something to do even though it was a lot of volunteers, even for Habitat. So that’s what was going on Saturday just south of the University. But it’s just the start.